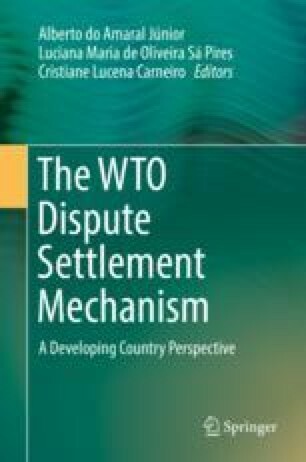 This edited volume offers a collection of analyses on the WTO dispute settlement mechanism from the perspective of an epistemic community of (mostly) Brazilian experts. Contributors share the common goal to look at the WTO from a developing country’s viewpoint. The WTO is situated within a highly technical field of international economic law, and the WTO dispute settlement mechanism is no less specific. In fact, dispute settlements at the WTO entail gathering expertise on highly complex issues, including production standards, public health and environmental standards, intellectual property, and scientific uncertainty. Thus, experts on the WTO dispute settlement mechanism inevitably confront complex cases that invite research and dialogue with experts from other areas of law and science. The repeated interaction of these individuals as they work to defend governments and interests of civil society, as they give opinion based on the highest standards of academic research, has contributed to giving birth to an epistemic community. In the case of this edited volume, we argue an epistemic community focused on the WTO dispute settlement mechanism that is informed by a developing country’s sensitivity, which we will elaborate further in the following paragraphs. This contribution was developed during her post-doctoral program at USP which was concluded in 2018.